Eggplant Parmesan is a delicious and amazing veggie side dish. Don't turn away when you hear the word eggplant. We will teach you all of the hidden tricks about Eggplant Parmesan and you'll be surprised at how easy it is to make. Have you tasted Eggplant Parmesan at a restaurant? It is so delicious and one of our favorite vegetable dishes. But to actually shop for one at the store seemed daunting. While shopping in the produce section at the grocery store, we never really gave eggplant a second glance. But those days are gone. We love eggplant in this easy and tasty recipe of Eggplant Parmesan. My husband and I went on a cruise in March with his family. One night, they brought us this delicious eggplant Parmesan. I thought it would be a good appetizer (it seemed kind of small), but with the delicious cheeses and sauce, it filled us right up. I had never bought an eggplant before, and I didn’t even know where to find it! But, with the delicious Eggplant Parmesan I had on the cruise, I was determined to make it happen. It was so easy, and the taste was out of this world delicious! So, if you’re afraid to cook eggplant, don’t worry. It’s a lot easier than it looks. what is eggplant and is it healthy? Eggplant is a vegetable from the nightshade family. Other nightshade vegetables include bell peppers and tomatoes. Globe or American eggplant is the variety you see most often and are familiar with. They are a large pear shaped vegetable with a deep purple skin. Their flesh is a creamy white color. Eggplants are very healthy. They are high in fiber, loaded with nutrients, and low in calories. A lot of their nutrients are found in their skin. So it’s the perfect veggie for any diet. Eggplants are available year round, but their prime season is from August through October. Picking a good eggplant is really quite simple. When you pick it up, you want it to feel heavy for its size. Look for a nice even and shiny skin tone. No discoloration on it. At the end of the eggplant, you should see a green cap. The green cap on top is a sign of freshness. Some will even have a green stem. You can test for ripeness by applying pressure with your finger on the eggplant. If it bounces back, then it’s ripe. If it doesn’t bounce back, then it needs a few more days to ripen. do you have to peel the eggplant? Every recipe with eggplant will vary slightly on how to prepare it and whether or not you should peel it. How you cook it will often determine whether to peel it or leave the skin on. Eggplant skin is edible. The skin on larger eggplants can be tough. If the eggplant is smaller and tender, the healthy skin can be left on. If you are frying or braising the eggplant, you can definitely leave the skin on. If baking, peel the skin and then slice or cube the eggplant (or whatever your recipe calls for). what does sweating an eggplant mean? Recipes with eggplant will often have you sweat the eggplant first. It’s not a big deal and usually doesn’t take more than 30 minutes to 1 hour. The length of time will often vary with each recipe. Eggplant holds a lot of water. When you sweat the eggplant, it will result in a tender and more flavorful tasting eggplant. Sweating the eggplant is a process where you literally help the eggplant release some of the water it is holding onto. It also has a tough skin and a bitter taste. The sweating process will give it a better flavor. After you slice your eggplant into 1/4 to 1/2 inch slices, sprinkle each side with salt. You can let it sweat out over a strainer. For our eggplant Parmesan recipe, we soak it in water with salt. After 20 minutes you will rinse the salt off and pat the eggplant dry. Then proceed with your recipe. Salted eggplant is less chewy. If the skin is left on, it’s not as tough and easier to chew because of the sweating. You can be so creative with our Eggplant Parmesan recipe. We love to add in other ingredients. Some of our readers have also suggested some fun add-ins too. Mushrooms – We love adding in fresh sauteed mushrooms. Ricotta Cheese – You can never have enough cheese, and ricotta cheese adds a little extra flavor. Zucchini – We added diced zucchini, it’s a great way to sneak in more veggies. Onions – Diced and cooked onions add so much flavor. Crushed Garlic and Basil Croutons – One of our readers used this in place of the seasoned bread crumbs. YUM! Peel the eggplant. Cut into 1/4 inch slices. Salt each slice on both sides and then let them sit in water for 20 minutes. Drain the water from the slices and rinse under cool water. Pat dry. Beat eggs in a small bowl and set aside. Place bread crumbs in a small bowl and set aside. Dip each eggplant slice in the eggs, and then dredge in the bread crumbs. Place on a baking sheet and cook in the oven at 450 degrees for 5 minutes, flip over and cook 5 more minutes. In a separate 9 x 13 inch baking dish, spread 1 cup of spaghetti sauce in the bottom of the pan. Layer with half of the eggplant slices. Add another cup of spaghetti sauce to the top of the eggplant slices. Top with 1/2 cup Parmesan cheese and 1 cup or mozzarella cheese. Repeat with the second layer of eggplant slices, then sauce and cheese. Top with fresh chopped basil leaves. Bake for 30-35 minutes or until cheese starts to turn golden. 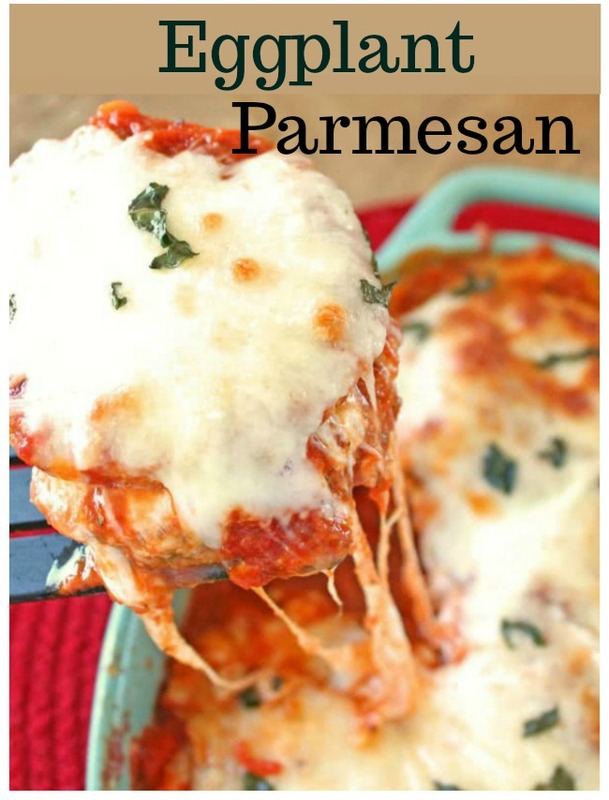 The layers of eggplant, cheese, and sauce, in this dish make a delicious, filling meal! Peel and cut eggplant into 1/4 inch thick slices. Salt the slices, and let them soak in water for 20 minutes. Drain the eggplant, and rinse with cold water to remove the salt. Pat dry. Place breadcrumbs in another small bowl. Dip each slice in egg, then dredge it in bread crumbs. Place each slice on a lightly greased baking sheet. Bake for 5 minutes on one side, flip them over, and bake for 5 minutes more. In a 9 x 13 inch pan, spread 1 cup of spaghetti sauce. Layer with half of the eggplant slices. On top, add another cup of sauce, spreading it evenly over the eggplant. Top that with 1/2 cup of Parmesan cheese, and 1 cup of Mozzarella cheese. Repeat with a second layer of eggplant, sauce, and cheeses. Bake for 30-35 minutes, or until cheese starts to turn golden. Watch how to make our Cowboy Caviar. Love eggplant! Thanks for sharing this!! I make a mean roasted eggplant, zucchini, mushroom and onion sandwich! I had never had eggplant and my husband said he didn't like it, however, this recipe was a huge hit. He has been asking for the link to this page to share with his foodie friends. The breading on the eggplant (I crushed up garlic and basil flavored croutons) and the two cheeses melted in your mouth. Definitely a repeater in this house! I just made this with eggplants from my garden! Fantastic! Take this recipe over the top by adding ricotta cheese to the layers... Sooooo delish!! Just cut the eggplant in 1/4 inch slices. Salt the slices and then let them soak in water for 20 minutes. Then drain the eggplant and rinse with cold water to remove the salt and pat dry. I want to make this for a friend who recently had a baby and has her hands full at home. I want to be able to freeze it so she can just heat in the oven and serve. Any suggesions? Cook the eggplant, make layers, then freeze? Any ideas for reheating/cooking through from frozen state? I would cook the eggplant, assemble, and freeze! It may need to be cooked a little longer to go straight from frozen to the oven. I would cover it for the first 20 minutes or so of baking, just so the cheese doesn't burn. Would sliced mushrooms be a good addition to this dish? We are mushroom lovers, so adding mushrooms sounds delicious! I have never cooked with eggplant before but I'm going to try this as I'm having friends over for dinner who are vegetarian. Is this dish something I can make the day before and keep in fridge or would you not recommend that? Thanks! It should be fine made the day before and keep in the fridge until ready to cook. This was the first time for me... never cooked an eggplant lasagna before. And it's exactly as you said: a lot easier than it looks! And beautiful, and really delicious! My family (Italian husband and two sons) loved it. Just follow the recipe, and you'll be greatly surprised. The texture was perfect! Thank you, this was a hit! Definitely will make it again. 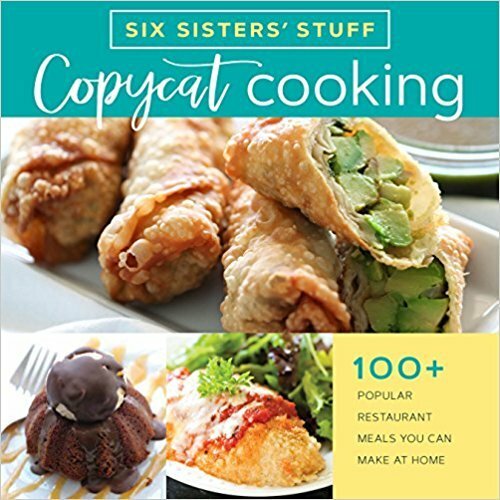 I couldn't tell you how many times I've made this recipe. Hands down one of my favourites. Even the meat eaters save room for this!